Located in Fayetteville, North Carolina, Fayetteville State University (FSU) is a public university offering degrees at the baccalaureate, master’s, and doctoral levels. Top Criminal Justice Schools ranked Fayetteville State University’s online master’s in Criminal Justice program as #1 in the nation. NurseJournal.org released its rankings of Best Nursing Schools and Colleges in the Eastern Region, and Fayetteville State University’s School of Nursing is #2 and the best among University of North Carolina system schools. 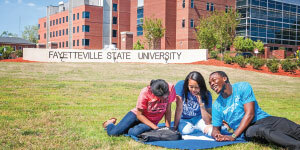 AffordableColleges.com ranked Fayetteville State University the #6 best in-state public university in the United States. U.S. News & World Report ranked Fayetteville State University’s online MBA program as one of the top 100 online programs in the nation and among the top five in North Carolina. Students enjoy nationally ranked degree programs, a variety of class choices, excellent teaching, and small classes with professors who have outstanding credentials. As a member of the University of North Carolina system and with more than 6,300 students, FSU provides students an exceptional, affordable college experience; a connection to career aspirations; and a close-knit, supportive community centered on student success. FSU is a diverse campus community.FSU celebrates the accomplishments of all its diverse graduates and is proud to be cited as a top producer of AfricanAmerican graduates in North Carolina and the nation (Black Issues of Higher Education). FSU’s focus on diversity includes race, gender, age, ability, socioeconomic levels, and a commitment to serving all students. 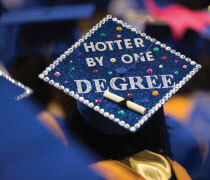 FSU prepares students for lifelong success. FSU is committed to helping students reach their goals so they graduate and thrive in life after college. From one-on-one advisementand assistance developing study skills to personal development, community involvement, exciting internship opportunities, and career planning, FSU supports students in reaching their full potential. USA Today selected FSU as one of 20 colleges out of 700 nationwide that create a campus culture fostering success. Founded in 1867, and as a historically black institution, FSU is alive with rich traditions. Engaging events like Welcome Week, Orientation, and Operation Smooth Move help students feel right at home. FSU hosts an exciting Homecoming celebration withsporting events, coronation, a fashion show, concerts, and many eventshosted by Greek organizations. Withmore than 100 clubs and organizations to choose from, FSU offers a way for every student to be engaged as a Bronco. FSU is a growing presence in the CIAA Conference. FSU has brought home championships in football, basketball, golf, volleyball, tennis, bowling, softball, and track. The University’smen’s and women’s athletic teams continue to uphold the Bronco tradition of excellence in NCAA Division II sports. Athletics at FSU go far beyond spectator sports. An active intramural program offers students the opportunity to participate in sports including flag football, basketball, jiujitsu, track & field, soccer, and swimming. FSU seeks to ensure that the cost of a college education will not prevent any qualified student from earning a baccalaureate degree. 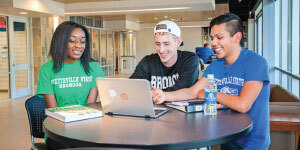 A study of 2,800 colleges and universities by the Lumina Foundation identified Fayetteville State University as one of the most affordable four-year public institutionsin the country. Last year, students received more than $65 million in scholarships and other financial aid. While other universities proclaim the promise of lower tuition, FSU prides itself on offering a high-quality education while remaining affordable. FSU is proud to be the university for you!